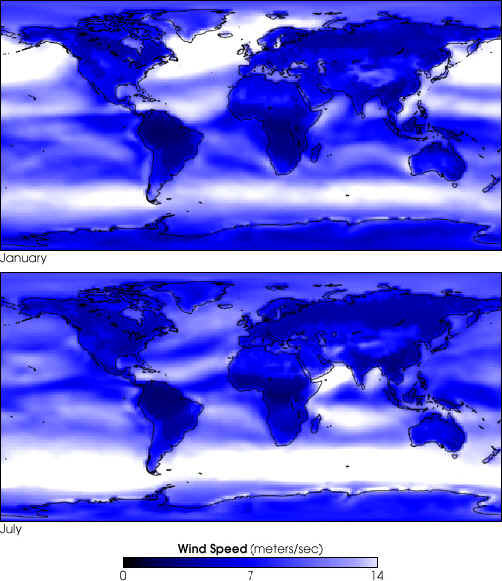 Global maps of average wind speed help researchers determine where to develop wind energy. Wind turbines (high-tech windmills) can generate power in places far from power plants and without an electricity grid�but planners need to know where there is sufficient wind for the turbines to operate efficiently. A team at NASA�s Langley Research Center developed these maps, and maps of solar insolation, and provide them free of charge. Private companies are using these data to design, build, and market new technologies for harnessing this energy. Brake: A disc brake, which can be applied mechanically, electrically, or hydraulically to stop the rotor in emergencies. Controller: The controller starts up the machine at wind speeds of about 8 to 16 miles per hour (mph) and shuts off the machine at about 55 mph. 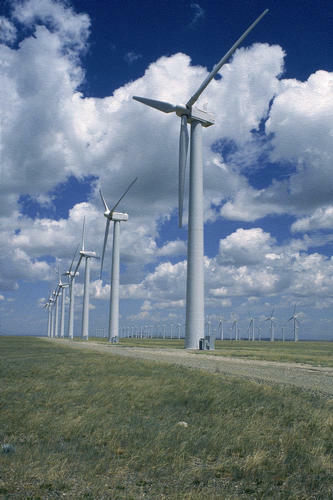 Turbines do not operate at wind speeds above about 55 mph because they might be damaged by the high winds. Gear box: Gears connect the low-speed shaft to the high-speed shaft and increase the rotational speeds from about 30 to 60 rotations per minute (rpm) to about 1000 to 1800 rpm, the rotational speed required by most generators to produce electricity. The gear box is a costly (and heavy) part of the wind turbine and engineers are exploring "direct-drive" generators that operate at lower rotational speeds and don't need gear boxes. Nacelle: The nacelle sits atop the tower and contains the gear box, low- and high-speed shafts, generator, controller, and brake. Some nacelles are large enough for a helicopter to land on. Pitch: Blades are turned, or pitched, out of the wind to control the rotor speed and keep the rotor from turning in winds that are too high or too low to produce electricity. Tower: Towers are made from tubular steel (shown here), concrete, or steel lattice. Because wind speed increases with height, taller towers enable turbines to capture more energy and generate more electricity. Wind direction: This is an "upwind" turbine, so-called because it operates facing into the wind. 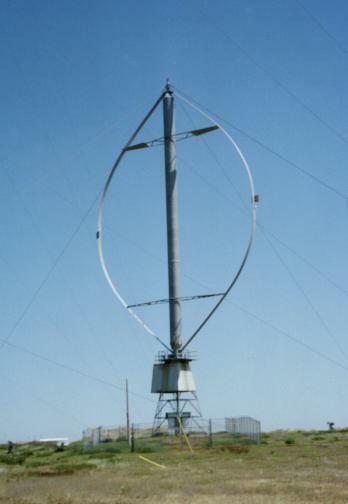 Other turbines are designed to run "downwind," facing away from the wind. All renewable energy (except tidal and geothermal power), and even the energy in fossil fuels, ultimately comes from the sun. The sun radiates 100,000,000,000,000 kilowatt hours of energy to the earth per hour. In other words, the earth receives 10 to the 18th power of watts of power. About 1 to 2 per cent of the energy coming from the sun is converted into wind energy. That is about 50 to 100 times more than the energy converted into biomass by all plants on earth. After reaching 1,000 MW of wind energy in 1985, it took more than a decade for wind to reach the 2,000-MW mark in 1999. Since then, installed capacity has grown fivefold. Today, U.S. wind energy installations produce enough electricity on a typical day to power the equivalent of over 18 million homes. 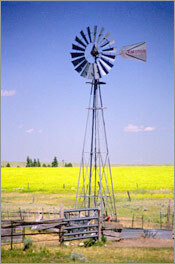 Since ancient times, people have harnessed the winds energy. Over 5,000 years ago, the ancient Egyptians used wind to sail ships on the Nile River. By 200 B.C., simple windmills in China were pumping water, while vertical-axis windmills with woven reed sails were grinding grain in Persia and the Middle East The earliest known windmills were in Persia (Iran). These early windmills looked like large paddle wheels. A model of a Persian windmill. 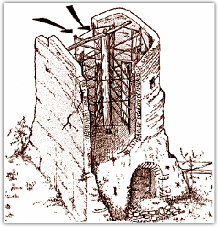 Vertical-axis windmills were developed before 500 - 900 AD (some place their invention much earlier) to raise water and mill corn and were still in use in the 1970's in the Zahedan region of Iran. 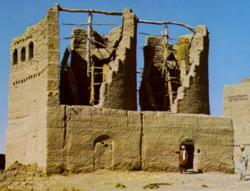 Ruins of Persian type windmills in Khorasan (a region that extends across Iran, Turkmenistan and Afghanistan). New ways of using the energy of the wind eventually spread around the world. By the 11th century, people in the Middle East were using windmills extensively for food production; returning merchants and crusaders carried this idea back to Europe. 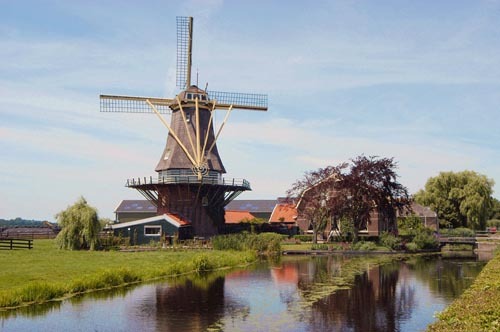 The Dutch refined the windmill and adapted it for draining lakes and marshes in the Rhine River Delta. In the early 1980s wind energy really took off in California, partly because of state policies that encouraged renewable energy sources. Support for wind development has since spread to other states.